Citing lack of unconditional consent and objections from parties, panel set up by The Wire to look into Nishtha Jain's allegations of sexual harassment against Vinod Dua says "no useful purpose would be served by prolonging the process". The external committee set up by The Wire: (from left to right) Prof Patricia Uberoi, former foreign secretary Sujatha Singh, Justice (retired) Aftab Alam, Justice (retired) Anjana Prakash, Prof Neera Chandhoke. Accordingly, the committee stands dissolved, the report said. A copy of the report was shared with The Wire and both parties on December 30. The committee was set up by The Wire on October 17, 2018 following a Facebook post by Jain in which she alleged that Dua had sexually harassed her in 1989. Dua was the anchor of The Wire’s popular video show, ‘Jan Gan Man ki Baat’, and had been working as a consulting editor since 2016 on a pro bono basis. Since neither Jain nor Dua were employees of The Wire at the time the alleged incident is said to have taken place, the organisation’s statutory internal complaints committee was unable to deal with the allegation. However, to ensure that neither Jain’s allegation nor Dua’s denial remained unaddressed, The Wire established an external committee to look into the matter in a time-bound manner. 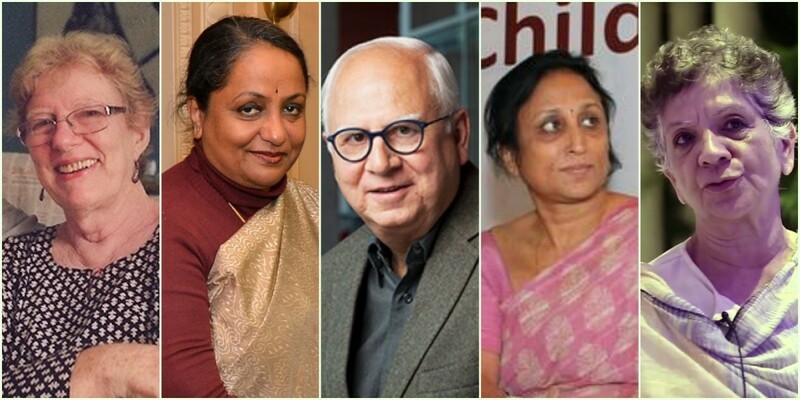 The committee comprised Justice (Retired) Aftab Alam, a former judge of the Supreme Court, Justice (Retired) Anjana Prakash, a former judge of the Patna high court, former foreign secretary Sujatha Singh, Prof Patricia Uberoi and Prof Neera Chandhoke, all of whom volunteered their time. However, after three meetings and “over a hundred emails”, the members of the committee reviewed the progress they had made and the obstacles which remained and concluded that there was no point carrying on. Report of the External Committee constituted by The Wire to enquire into the allegations of sexual harassment made by Ms. Nishtha Jain against Mr. Vinod Dua. This Committee was formed, on request by The Wire, to enquire into allegations of sexual harassment made by Ms. Nishtha Jain (henceforth “the complainant”) against Mr. Vinod Dua (henceforth “the respondent”). At the time the complainant put the matter in the public domain by posting her allegations on her Facebook page (14 October 2018 and onwards) the respondent was associated with The Wire as a Contributing Editor and also broadcast on The Wire’s platform a video programme (Jan Man ki Baat) that commanded a sizeable viewership. However, the allegations of sexual harassment pertained to the year 1989 when The Wire was not in existence, and thus had no association with the respondent. Nonetheless, the Internal Complaints Committee at The Wire took notice of the allegations but later came to the view that the matter fell beyond its purview. The Wire, however, did not let the matter rest at that stage but approached and requested all the five individual members who now form this Committee to enquire into the allegations by the complainant against the respondent. At the same time, it suspended the respondent’s programme from its platform until the Committee made its report. In setting up the Committee with the aforesaid object and purpose, The Wire indeed lived up to its declared policy on the issue of gender justice at considerable risk of losing a good number of viewers and sponsors of the programme. As to the procedures, the Committee will adhere to the principles of Natural Justice, primarily the rule of Audi Alteram Partem (“listen to the other side!”). It follows that both the complainant and the respondent will personally appear before the Committee and allow themselves to be subjected to cross-examination by or on behalf of the other side. If any side wants to present any witnesses in support of their respective cases, the witnesses too would similarly appear before the Committee to make their statements and would be cross-examined by the other side. It may be noted that the complaint incorporates screen shots of a number of posts made by different persons. The Committee may not consider those posts as corroborative material unless the person making the post appears before the Committee, makes the statement and allows herself/himself to be cross examined on behalf of the respondent.Each side may present its case personally or through her/his representative who may be a friend or a colleague. The Committee will strongly discourage the appointment of any professional lawyer as a representative of either side. Further details of procedure will be settled in consultation with the parties when they first appear before the Committee. The Committee would follow a procedure that is transparent to both sides but would keep its proceedings confidential until the final Report is handed over to the parties. Until then, any breach of confidentiality by any side would be deemed a breach of the Committee’s declared procedure. The minutes of the meetings were sent to both sides. The Committee received the respondent’s Statement on 3 November 2018, in which he completely denied the allegations made by the complainant, countering each allegation point wise and citing circumstantial facts that, according to him, completely demolished the complainant’s allegations. He also asked the Committee to treat it as his full and final statement and reply. The respondent’s Statement was forwarded to the complainant for her response. “The parties should bear in mind that this Committee is a non- statutory body formed at the request of The Wire. The Committee has no precedent, since to its knowledge no other non-statutory and non-government committee has been constituted to perform a similar task. The Committee’s only source of (moral) authority is the unqualified consent of both sides to take part in the proceedings before it and assist it in arriving at its findings. The Committee, therefore, expects the parties to repose full faith in its proceedings. The task before the Committee (its terms of reference) is to examine the accusations made in the complaint and to come to a finding with regard to its veracity in light of the respondent’s defence and the evidence adduced by the parties and then to make recommendations on the basis of its findings, which would be morally binding on The Wire, the complainant and the respondent by virtue of the consent given by them. The minutes of the meeting were sent to both sides. The complainant thereafter submitted her response to the respondent’s Statement on 26 November 2018, wherein she countered the respondent’s arguments in detail. At this point in the proceedings the Committee, apart from addressing the complainant’s concerns also took note of the statements made in the respondent’s Statement that the Statement should be taken as his full and final reply and that he would neither be cross-examined nor cross- examine anyone. In this regard the Committee sought clarifications both from The Wire and the respondent. The Wire denied having given any assurance to the respondent in regard to the procedure that the Committee might adopt for the enquiry or that he would not be cross- examined by anyone. But the respondent’s position was that The Wire decided on its own, without information to him, to take cognizance of the complainant’s Facebook post and to inquire into it. Further, that The Wire, on its own and without informing him, decided to set-up this Committee. The steps taken by The Wire were without any information to him and he was presented with a fait accompli giving him no choice but to participate in it. Despite this, he gave consent to the enquiry for it would give him an opportunity to clear his name but the consent was apparently subject to the condition that he would not be subjected to any cross-examination. It is thus clear that the respondent’s consent to the enquiry by the Committee was from the beginning qualified and not unconditional. The respondent has since moved forward from his original position that apart from submitting his written Statement, he would not take part in the Committee’s proceedings. He has agreed to appear before the Committee (provided the complainant or her representative is not present) and answer any questions that the Committee might wish to make on the basis of his Statement. However, the respondent is still firm on his stand that he would neither cross-examine anyone nor let himself be cross-examined by the other side. At its third meeting, on December 19, the Committee noted that it has taken nearly two months to arrive even at this stage, where the consent of the parties is clearly not unqualified and further, that it seems to be tentative to each stage of the proceedings. The process which has already taken longer than it should have continues to be fraught with objections from the parties at each stage, with the end nowhere in sight. The consent by one of the parties to be subject to the Committee’s enquiry has been given on certain conditions of which at least one is not acceptable to the Committee. And the concerned party is not willing to withdraw this condition. The upshot is that the Committee does not have the unconditional consent of both sides, which alone can be the source of its authority to proceed further in the matter. Apart from the three meetings that it has held, the members of the Committee have shared their views with each other over more than a hundred emails. The Committee has also interacted with the parties who are the subjects of the enquiry before it. On the basis of the materials that have come to it and the positions taken by the parties the Committee comes with regret to the conclusion that no useful purpose would be served by prolonging the process and that it is unable to proceed further in this matter. As noted in the minutes quoted above, this was the first such External Committee, conceived with the object to enquire into allegations of sexual harassment in a situation not covered by the statute. Had it been able to complete its work, it would have set a precedent for the future. Unfortunately however, this has not been possible for the reasons elucidated above. The Committee would like to put on record its frustration over a potentially useful exercise being aborted midway. would accord the requisite priority to the matter at hand and assist in the proceedings being completed in a time bound manner. Before it dissolves itself, the Committee makes it absolutely clear that it is not commenting upon any allegations made by the complainant nor on the counter allegations made by the respondent against the complainant, and the pleas taken by him in his defence. With the aforesaid the Committee hereby dissolves itself. Now that the Committee no longer exists, it would not be in a position to receive any communications nor to reply thereto from anyone.